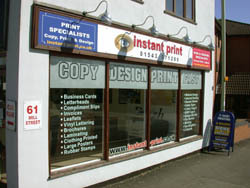 Instant Print is a family run company dedicated to producing excellent quality products and utterly reliable backup. We hope that you will avail yourself of our services and if you need a human voice to speak to, our designers will be able to discuss on a friendly basis, your requirements, or call in at our trade counter and see us. Over the last 15 years we have expanded our knowledge base to cover all corporate printing and signage needs and now the highway safety market.